A couple weeks ago we had a special guest visitor come to see us. Our visitor has been a Ford trainer for several years and is passionate about Ford services and products. You could see it in the way he talks and in his demonstrations. Our sales team consisted of two groups. One morning session and another session in the afternoon. During the training in the morning, we started to talk about the auto industry and how things are changing. One of the big changes which most of you heard about is that Ford is no longer going to be selling cars in North America. The reason is to follow the trend in today's current market for vehicle sales. There is a shift where new vehicle buyers are buying more SUVs, Crossovers, and Trucks. Ford has also announced that they will be bringing hybrid technology into their line up as well. One of the vehicles getting a hybrid drive-train is going to be North America's bestselling truck for 53 years, the Ford F-150! We discussed why a hybrid system would be beneficial in a truck. The main reason is for more torque for towing. It will be a huge advantage that will be taking place in the next few years. 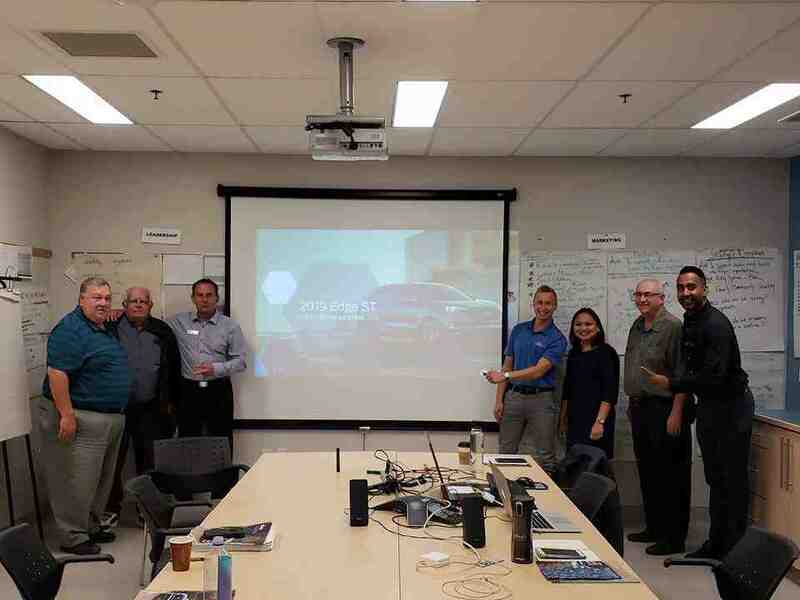 After discussing what has been changing in the Ford Motor Company Industry we decided to focus on some of the Driver Assisted technologies in the current vehicle line-up. Adaptive Cruise Control and Forward Collision Warning with Brake Support, 360-Degree Camera with Split View Display, Pre-Collision Assist with Pedestrian Detection, Enhanced Active Park Assist with Parallel and Reverse Perpendicular Parking, BLIS (Blind Spot Information System), and Lane Keeping Assist. All these technologies have been proven to be successful in today's day to day life for the consumers. These technologies are just one of the ways Ford is making their customers safe behind the wheel. Then we got to go on a demo drive in a new vehicle that has not been released to the public yet. I would love to tell you all that it is but under no circumstance are we allowed to inform you about the vehicle we drove. Let's just say this, Ford is bringing some game-changing features and will remain as one of the industry leaders. Once returning from the demo drive, you could see the look on everyone's faces. Everyone was smiling and was blown away by the new vehicle we drove. The power and performance were definitely there when you wanted it. The best part about it was the safety features and the design of this refreshed SUV. After interviewing one of our sales consultants, there are a few things he highlighted about the training. Dave's biggest take away was also his favorite part of the training. That was being shown all the new active safety features on the new vehicle and how it looks like Ford is really concentrating on safety in their line-up. Some final notes from Dave are that the trainer was professional to the highest degree and he even knows a fun fact about the trainer! The trainer used to race cars! At the end of the day, we all learned a ton of valuable information to take us to the next level of service for our customers. We will continually and ethically provide automobile solutions to our customers. Training our staff just one of the ways that we accomplish that. Make sure to follow our blog to keep up to date with the latest updates!